I own all of the products I list and while I haven’t personally tested them against a wide variety of other models, I researched them well and am very pleased (many are Cook’s Illustrated favorites). 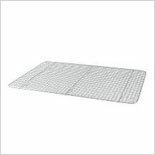 Use to cool your biscuits, or slip inside the Wearever Cookie/Baking sheet listed below to roast meats. It’s constructed sturdily with a central brace and six feet instead of four so it won’t warp under high heat. If your oven’s on the fritz, use it on the grill! Vegetables, shrimp, and meats won’t fall through it. Available for around $14 and eligible for free shipping from Amazon.com. I was surprised what a difference this sheet made in my baking and roasting. Its 13-gauge thickness transfers heat properly, so my food doesn’t burn on the bottom. (unlike air-bake sheets, blecch), and it’s easy to clean — just use parchment paper (or cut-up paper grocery bags in a pinch) as a liner. The CIA Wire Cooling Rack (above) fits perfectly inside for roasting; you don’t want a non-stick pan since the wire rack will scratch it. The sheet measures 12-7/8” x 17-3/4”. Available for around $24 and eligible for free shipping from Amazon.com. 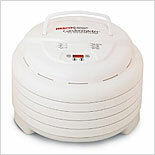 When researching dehydrators, this model often came up as a best buy. It’s easy to use but not whisper-quiet – but I suspect none of them really are. (I set mine up in the laundry closet and keep the door closed.) I use it to dry fruit, vegetables and nuts, and to revive soggy cookies, crackers, chips, etc.. 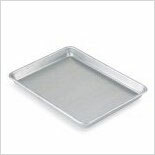 I recommend buying two extra trays (see below); if you’re going to go through the trouble of dehydrating something, you might as well dry a large batch. Available for around $110 on Amazon.com. 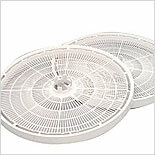 These two extra trays expand the drying capacity of the Nesco American Harvest FD-1020 Gardenmaster dehydrator (above). Available for about $11.50 on Amazon.com. 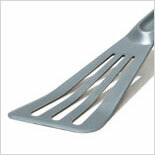 For years, I’d been using the same two thick black rectangular spatulas. I’d melted the front edge so many times, flipping my food had become a major ordeal. I finally broke down and spent $12 on a new Pelton. Why did I wait so long? It’s thin enough to slip under the most delicate pancake, yet strong enough to lift a flip a mondo-burger. I’ve had it for a year and there are no signs of melting. Available for $12 and eligible for free shipping from Amazon.com. Amazon.com. Picture this: the electricity goes out, but you’ve stocked up. You have a pantry full of tasties, but for some reason, your electric can opener isn’t working. D’oh! 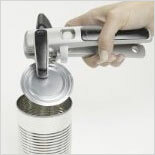 This manual can opener, lucky for you, is easy to use. It slices through the lid rather than the sides of the can, but the magnet safely lifts the lid so you’re less likely to cut yourself. Available for around $22 and eligible for free shipping from Amazon.com. It cooks evenly, and nothing seems to stick to it — which is great for situations when the water supply is limited. 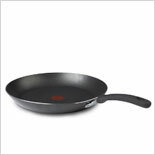 Frankly, Teflon® scares me a bit, so I don’t use this pan for anything that isn’t prone to sticking. I’ve had mine for over a year, though, and the surface looks as good as new. (My research revealed it can take a lot of abuse because of a proprietary 5-layer coating). Available for around $33 with free Super-Saver shipping from Amazon.com. 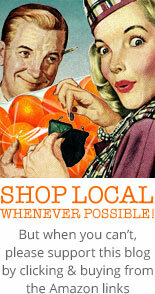 Although it’s always best to buy local, clicking the Amazon links above help me fund this blog. Profit motive doesn’t influence my decision on which products I choose, however; if I love something and it’s not available on Amazon, I’ll tell you where you can find it. Read this post for more information on how these products are chosen.